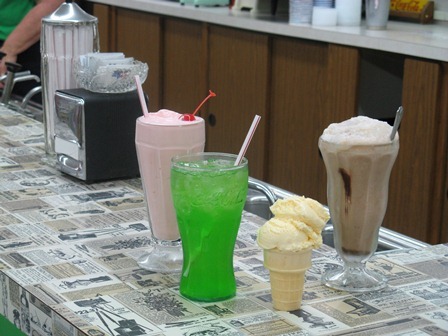 Step inside Gibson Health Mart Drug and check out this old-fashioned soda fountain. Sample their handmade treats and find out why everyone still raves about them! This soda fountain is one of the oldest in the state of Kansas. It opened in 1892 inside Gibson Drug, which has been a fixture on Main Street for over 100 years. The soda fountain has changed through the years but one thing has remained the same--it's still the favorite spot of children and adults alike. Stop by and sample your favorite treats, which are made by hand when you order them. Customer favorites include Green Rivers, Vanilla Cream Cokes, and Old-Fashioned Sodas. Try one for yourself and relive the good ole' days! Open Monday-Friday 9 a.m.-6 p.m.;Saturday 9 a.m.-1 p.m. Soda fountains were one of the 8 Wonders of Kansas Customs!